Wave that flag!!! Now that summertime is here - keep an eye out for these. 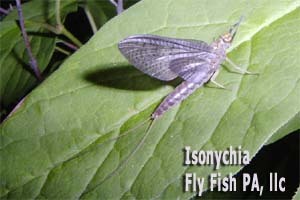 They are one of only a handful of mayflies where the male and female each have small eyes. Common name is the yellow drake. FYI...the reports are gonna take a hiatus come the middle of this week - they will resume the middle of next week. May 29, 2004 - Lehigh Blowout...Plan B! Yesterday we had a special guest lined up to float the Lehigh, but Mother Nature would not let us pull it off. The heavy rains up on the Pocono Plateau, combined with an all out surge of water, released by the Army Corp, had us looking for other options. 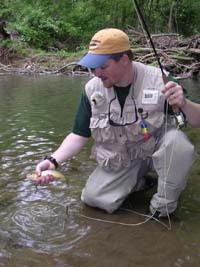 So with the cancellation we were able to hook-up with TCO Fly Shop owner Tony Gehman for a little small-stream action. 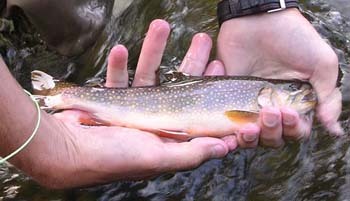 We found plenty of native browns and brookies in Mud Run, that were willing to pounced all over our nymphs. It really did not matter if it was a braided stone, hare's ear, pheasant tail or nitro! Little or no action was found on top. From there we decided to hit the Pohopoco for some sulphur action. But due to some some higher than normal releases and 51 degree water, the bugs never materialized. However, there were some caddis though and the fish did come up for these sporatically. Flashback pheasant tails, nitros and shop vacs also were producers. 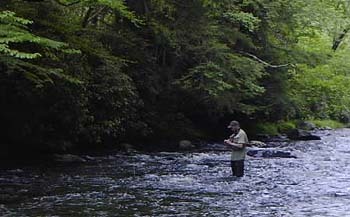 This stream right now is just loaded with fish - nothing too big, but lots of action to be had on a 4wt. This is a really neat stream that does not get much pressure. Just think if the Lehigh coming outta FEW had these temps?! 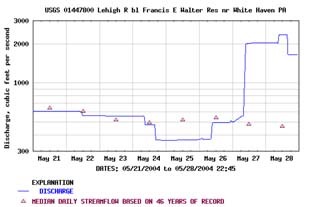 Going into the weekend it looks like the Lehigh will continue to have non-fishing friendly flows per the post on the ACE website. We did need the rain though since water temps were getting up there. Other streams should be perfect...so get out there and enjoy the long holiday weekend. The MV countdown is on!!!! be detrimental to the downstream environs. Lookin for that magic fly.. The weather gods have moved us right into the summer season. The hatches have been coming off fast and furious, and seem to be occurring in shorter duration and later in the day. We need some cooler weather and some rain for our coldwater streams..
.we will give you the real-deal on the current stream conditions. not sure what it was, but they did get into one rainbow that went about 14", a few smallies and one FAT fallfish that sipped in a sulphur. We were able to dodge the weather and had a very enjoyable evening on the river. One thing to keep an eye out for is the rising water temps - anglers should definitely key on the low-light periods of the day when water temps are at their lowest. Some cooler nights will help that out. begun to notice a few of the above - slate drakes. A pig of a Penns Creek rainbow! Karl hooked up with another Spring Creek brown! 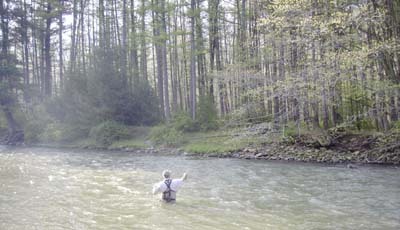 Valley Creek, Friday morning, was fishing well when I had the opportunity to host Christian Berg of the Morning Call newspaper. He and many other outdoor writers were in the Valley Forge area for the Annual Pennsylvania Outdoor Writers Association (POWA) conference. Along with Berg on the Valley Creek trip were POWA member and VFNHP volunteer - Bob Ballantyne and POWA Member- Harry Guyer, Jr. of Loysburg. 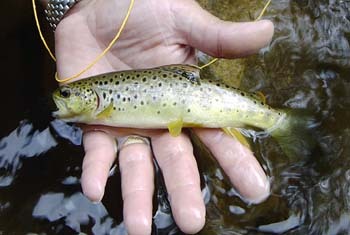 Most fish took either the Ultimate or the Nitro, but some were hungry enough to exert the extra energy for the dry fly. Hardly any bugs were seen, but there were a few risers here and there. Being able to read the water and hitting up the really fishey spots were the key. A weekday does not hurt either ;^) Water temp was about 60 degrees and the clarity was great for us fisherman. Weather was overcast and damp! Fantastic outing!! Bergman loved it! In the evening this nice 14"+ was landed. Shoot us an email to find out more about this fishery or to learn how to get involved in protecting it!!! high-water debris above his left shoulder! We've got some Lehigh trips along with our Penns Creek-Spring Creek/TCO Weekend on tap. Check back for the real-time on these waters! LRSA members, Bill and Tom, were out the other day for some evening action. Sulphurs, march browns and a few caddis were hatching. Heavy, heavy sulphur hatch at dark. Tom hooked two fish. Bill had numerous hits in the beginning and then landed two fish off the surface at dark one going 14". The water level continues to look nice! Weather pending the weekend conditions should be about perfect for this time of year. Stopped by Valley tonight to find it high and off-color, but on the drop. No sulphurs were seen at all. A few fish were moved on green woolly buggers. Overall it was a pretty disappointing outing. Water temp was 61 and there were a few olives about. 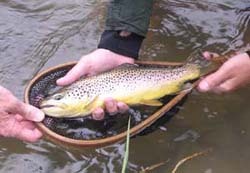 One of the browns Bill brought to net. Dean had out Rick and Don yesterday on the Lehigh. There were spotty risers here and there throughout the day, but nothing really of any consistency, except for the evening. 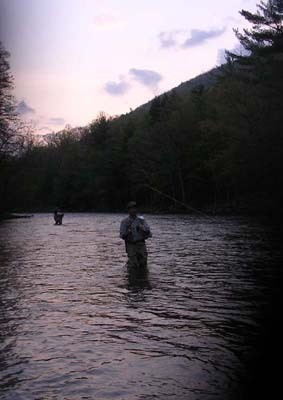 During the day - streamers and nymphs did the trick in the fast water. Water temps were about 65 even though the water is coming out of FEW higher than that! Just goes to show how much cold water dumps into the Lehigh while it courses down through the gorge. Lower light brought out the sulphurs - big-time! Lots of rising fish! There were lots of hook-ups, but only a few fish landed. 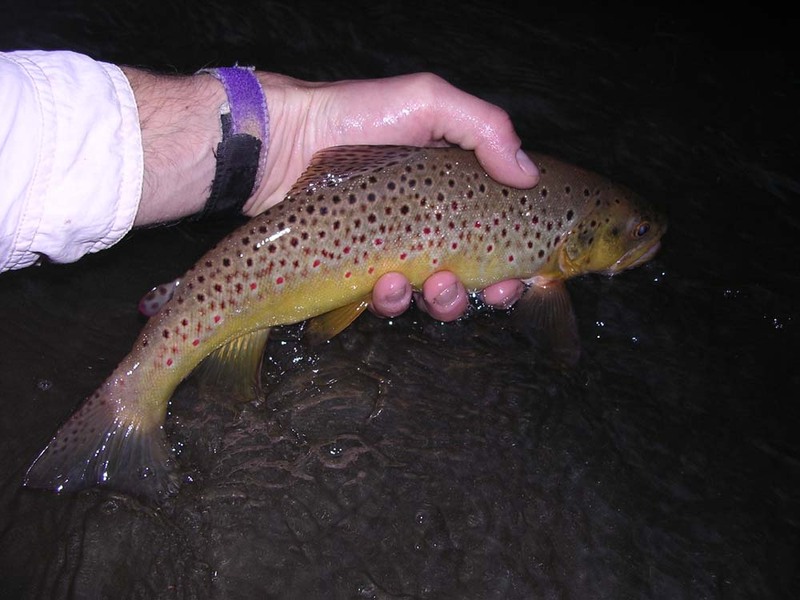 We've got more trips lined-up this week - we expect to see the good dry fly action continue. And look for even more risers as levels continue to drop. Currently it is about 1700 in Lehighton. 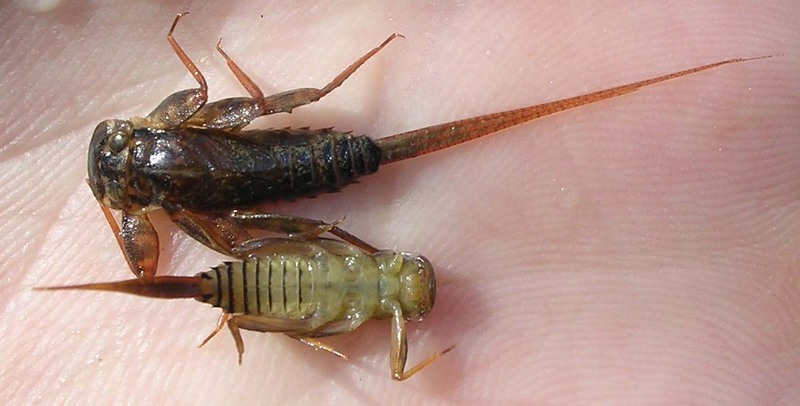 Other bugs noticed throughout the day - march browns and caddis. The action on Penns has been very good lately. Look for the march brown and grey fox to wind down. Spinners will still be about though. The sulphurs should be happening. Look for action on the Tully to continue at a steady pace. It is that time of year where daily hatches of tan caddis are the norm. Flows are just perfect - running at about 200cfs. This flow should continue barring any drastic changes in precipitation in that area. For real-time data - talk to TCO - 610.678.1899. The Lehigh has been borderline unfishable. It is right at our cut-off level for effective-floating. For the wader - you can forget about it - unless you are extremely familiar with this river. While on the water look for grey fox, march browns, sulphurs, bwos and the start of the sulphurs. At this level fish will seek out the banks and edges. Water temperatures are just about right for this time of year. Streamers are always effective - be it for trout or the smallie population. 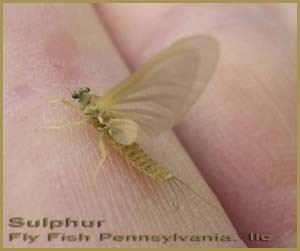 Now is the time to look for the sulphurs on Penns. Flows for this time of year could not be any better. 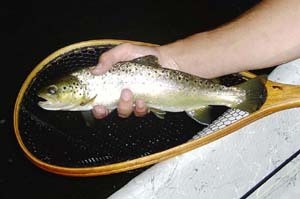 Spend the day there - nymph during the daylight hours and then hit the evening hatch and spinner fall. Definitely have some rusty browns in size 12-14 and soon enough the sulphur spinners should be bouncing about above the riffs. Send us an email for questions or to book a trip. The sulphurs have arrived!!! However, the hatch does not seem to have kicked into high gear yet. 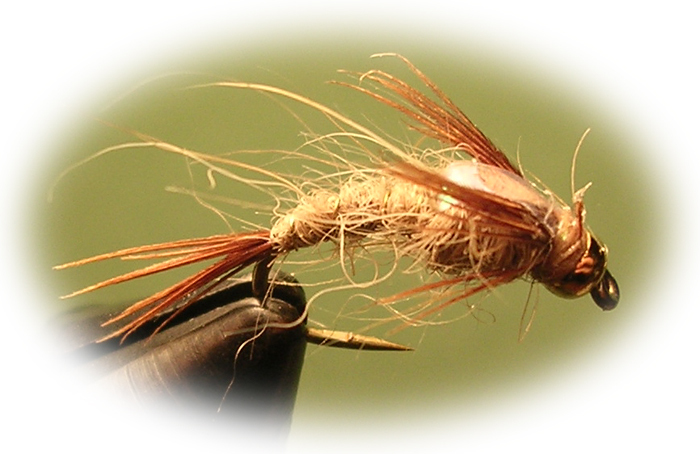 On streams where this mayfly occurs, a sub-surface rig consisting of a pheasant tail, can really be effective. And vary up those nymphs with flashbacks and beadheads. 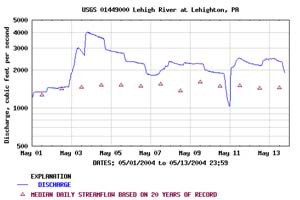 On Saturday the Lehigh was too high to float. Hopefully the flows will come down some so we can get into some dry fly action. 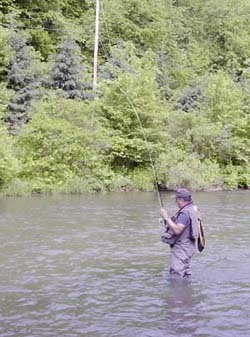 As for the wade fisherman - conditions have been far from perfect. Borderline untouchable! Spots are available for our Penns Weekend in June. 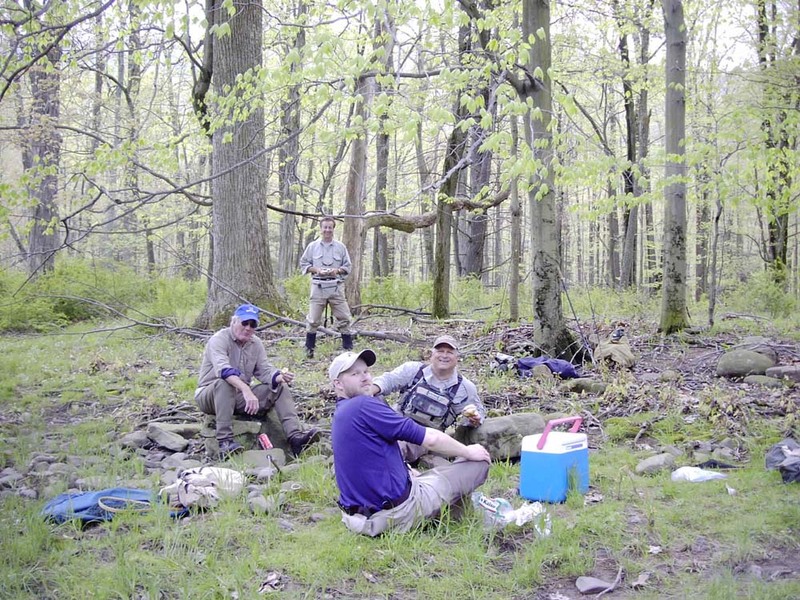 This past weekend we hit Penns Creek for our first annual Penns Creek Ex-Stream Trip - sponsored by TCO. With us were Ron, Jim and Dave. 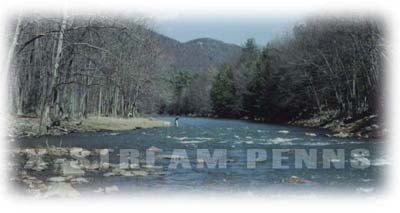 Ron and Jim have fished Penns before with limited success and looked to increase their odds. 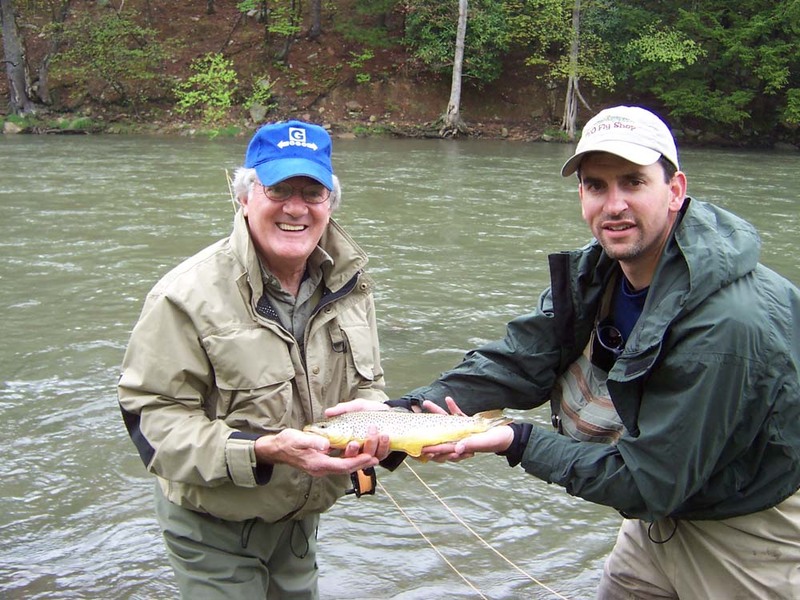 Dave, a die-hard steelie fisherman, wanted to experience dry fly fishing over some of PA's wiliest brown trout. With decent conditions - expectations were met. Even though at times our clients were questioning our approach on how we tackle this difficult stream. 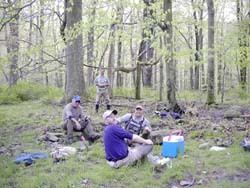 But they did persevere and were rewarded with some phenomenal fishing in our minds. 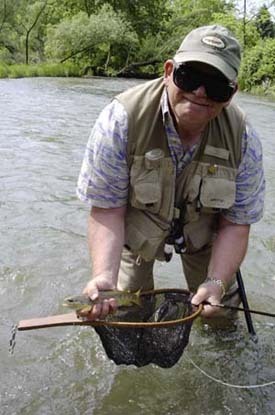 Ron was high-hooks for the weekend, however only a limited number came to net. Actually the joke was on Ron this weekend because we tied our special hook-less flies to the end of his tippet. Jim is now hooked on fly fishing. 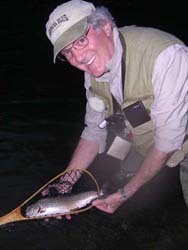 Jim caught some absolutely beautiful wild brown trout and throw in 3 wild brookies to boot. 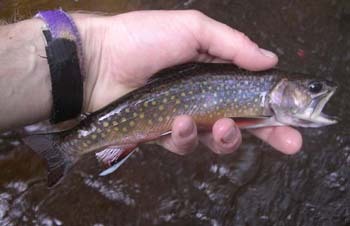 All of the brookies were taken off the top. Very cool!! Dave got off to a slow start, trying to adjust from slinging lead, to more of a delicate cast. 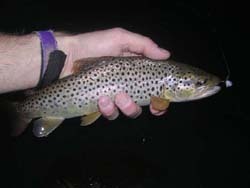 But he honed his skills enough to entice an awesome 17" Penns brownie. 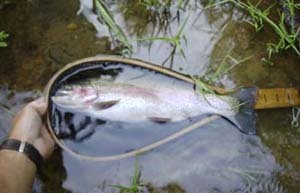 This fish was also taken off the top, holding tight to the bank. This was the largest fish of the weekend. Below are some pics. Great weekend!! We are already looking forward to the next Penns trip scheduled for June. Dean and Jim sporting a beauty!! Take notice of that water color - prime sub-surface conditions. Jim with a nice one. March brown and grey fox nymphs....hint hint. 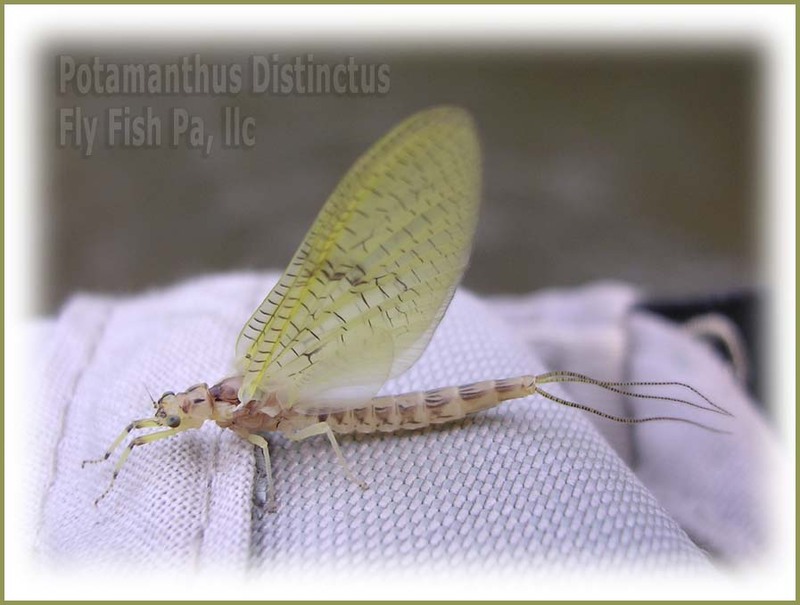 Just some really quick pics from the past few days on Penns....good flows and some cooperative fish made the weekend on one of PA's most difficlut trout fisheries a great time - Ron, Dave and Jim - it was our pleasure! Look for this good action to only continue. But more precip is on the way - so keep an eye on those flows!! All fish were fat and extremely heathy looking. Check back for more updates. Dave doing some deep water nymping. Even though this is central-PA, this water looks steelie-green! This one took a spinner.